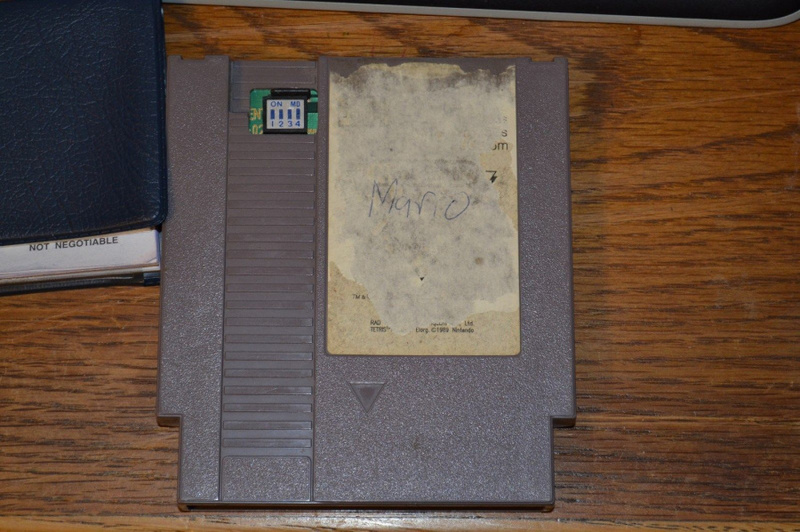 If you've got a few thousand dollars just sitting in your bank account doing nothing and you fancy owning a piece of (somewhat grubby) Nintendo history, then point your browser at this eBay auction for a NES Nintendo World Championship cartridge. These cartridges were produced for the 1990 Nintendo World Championship event, and only 90 are believed to exist. On the cart are specially modified versions of the three titles used in the tournament: Super Mario Bros., Tetris and Rad Racer. Those taking part in the contest were each given six minutes to rack up a high score in each title. Each semi-finalist received one of these carts after the competition had concluded. At the time of writing the cart is going for a cool $5,801.00 USD, and you can expect to see that value rise as the auction comes to a close — previously, one of these cartridges was sold for $11,500 USD during the 2011 Child's Play Charity Auction. However, while this is one of the rarest Nintendo-related items on the planet, it's not as desirable as the gold-coloured edition of the exact same cartridge, of which only 26 were ever produced. Copies of that edition have been known to fetch as much as $18,000 USD. Obviously, you'll immediately notice the ripped label. This is quite unfortunate but happened many decades ago by this point in time. No one knows the exact number of this cart (as each NWC cart was individually labeled upon production) as it appears in the upper left-hand corner of the cart label. This is known as the infamous "Mario" NWC cart that someone probably wrote on there long ago not having a clue what they actually had. Still, case in point, this is an authentic, original NWC cart from the championship back in the early 90s. The cart plays just fine and may some day be worth much more if someone decides to investigate a forensics lab's involvement to see if they can determine the official number by running tests on the cart. Are you tempted to make a bid, or can you not see the point of spending such a massive amount of cash on something which looks like it was found in a dustbin? As ever, you can post your thoughts below. So how do you know it isn't a reproduction. (Like basically all of the expensive cartridges on Ebay). Something potentially that valuable there would be no reason to sell it on Ebay due to the huge amount of fakes reducing the amount you are likely to get. The label screams out that might be the case to me. (Although I am not trying to buy one so I haven't researched it). It is an absurd amount of money hut then again... I want it! In that condition there's no way it's worth that money. There's no authentication, and it's in terrible condition. I guess there's a sucker born every minute though. Even so, the value dropped since the original label was scraped off. It shouldn't be worth more than 9k or 10k. but you sure that's legit? I never understood stuff like this. If a great game is rare, like Panzer Dragoon Saga, then I totally get paying all that much for it... but I don't get wanting something purely because of it's rarity. @Peach64 I am the same but only collectors would be interested in this to complete there NES collection but that would mean they would need the even rarer gold version also. This crappy copy? Why wasn't this near perfect gold cart reported a few weeks ago? @SilentHunter382 And Earthbound Zero of which only certain questionable versions exist but it came from inside Nintendo (And they all look like reproductions). Where do you draw the line. What about Famicom stuff that was bootlegged onto NES cartridges. @Zobocop You cannot even play that making it even more pointless. if it is arepro, then it is certainly a different board then the one used in the retroousb version. @Zobocop The listing implies you cannot easily. @unrandomsam Regardless of the copy, this is a collectors item only. There is absolutely no reason to play this game considering what's on it and how short it is. What beautiful artwork. Nice and minimalistic. Technically there were probably more than 90 of them made (given the highest serial number I believe is 300-something) but the copies that weren't given to winners were probably destroyed. The bidding is already up to about 33 grand at this moment, so one does have to wonder if the bidders are serious. Agreed, $90 grand is bull crap. eBay needs to ban the trolls bidding this up. People... Let's not get carried away! First, it more than likely is real. Anyone who grew up with a nintendo NES is a liar if they ever thought their console (much less their games ) were gonna be collectors items. My buddy has quite a Few games (single owner- him!) that are in terrible condition! I wouldn't dare to call them fakes... Collectors see this as an opportunity to expand their collection. although, there's no way in hades I would pay that much for a game (used or otherwise)! It's going for $94,100 at the moment and no body really knows if it's real or not! I'd hate to win it at that price and then find out it's a fake. It's up to nearly 100k. I might be able to see a collector paying that amount for something in mint condition; since collectable's hold different value to each individual (and the size of their pocket book). But based on the condition and the amount being bid this seems more like a posturing war now since it's become a news headline just to win. @the_truth If that's legit and this dude actually made a page dedicated to cleaning it off, I mean, the horror. There is no way the seller is getting 100 grand for this. This reeks of bid inflation with no intention to buy. When NWC gold went up up for auction some years back, it's winning price of over 40k ended up being 17.5k. Still, everyone calling this junk is out of their minds. If I had 30k lying around in a savings account, I'd absolutely try to buy this game. It's the GRAIL. its at 99k now ! wtf lol! unreal! No one posted the AVGN video of this game yet? "The cart plays just fine and may some day be worth much more if someone decides to investigate a forensics lab's involvement to see if they can determine the official number by running tests on the cart." I can't believe people give money for this.